Usually prepared when you have some leftover mashed potatoes – but can be made ‘from scratch’, starting with real raw potatoes. 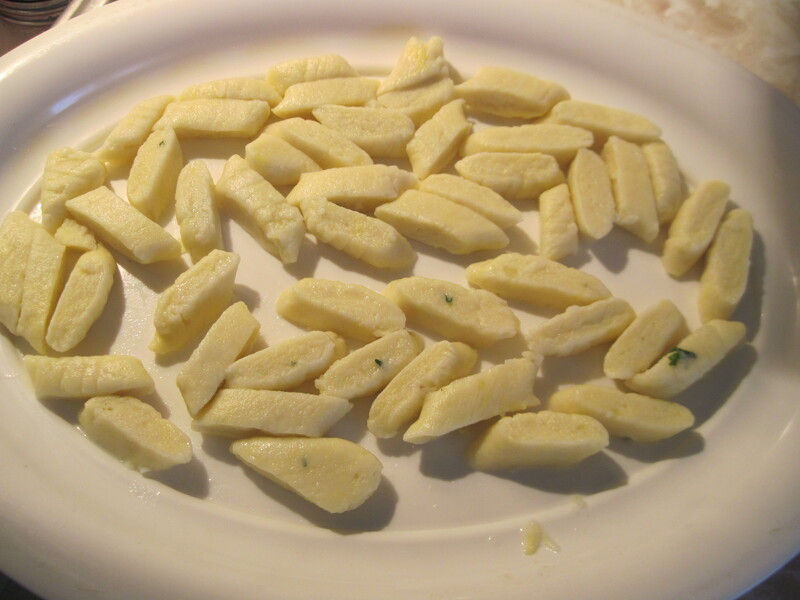 In such case you should boil potatoes in salted water, mash them, and then measure the amounts to achieve the balance. Served as an accompaniment to meat with sauce, or as individual dish with sauce, with veggies, or with bread crumbs sautéed in butter. Kopytka are excellent when served ‘refried’. 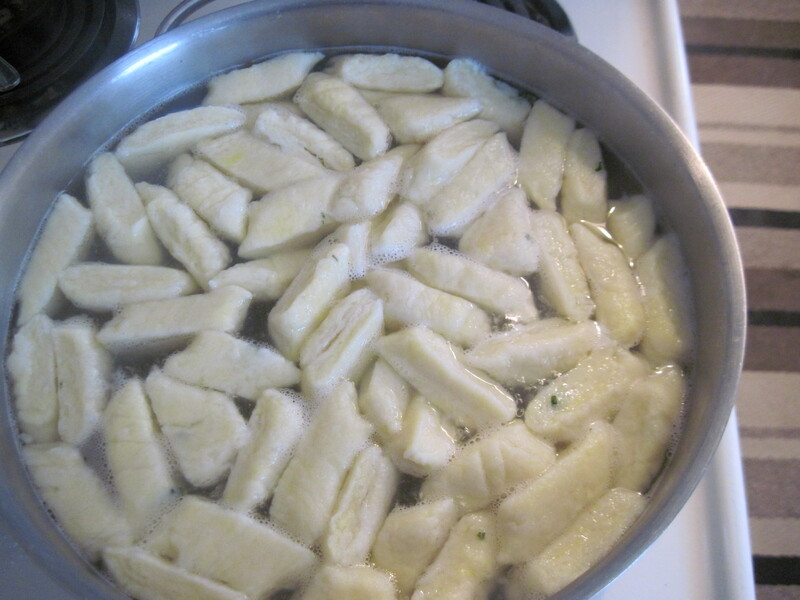 When ready to re-heat the frozen kopytka, prepare a large pot of boiling, salted water, drop them in, let come to boil and then give them a minute or two to heat through. 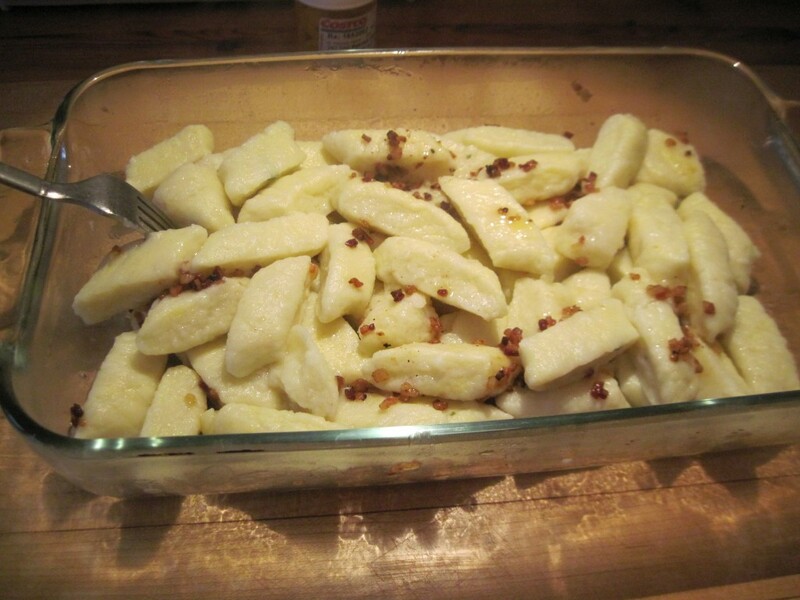 This portion should feed 4 people when served as a companion to some other stuff like meat stew, hamburgers etc., but perhaps 3 hungry people, consuming kopytka as the main course event (with skwarki or fried bacon bits, with sauce, with a vegetable salad..). 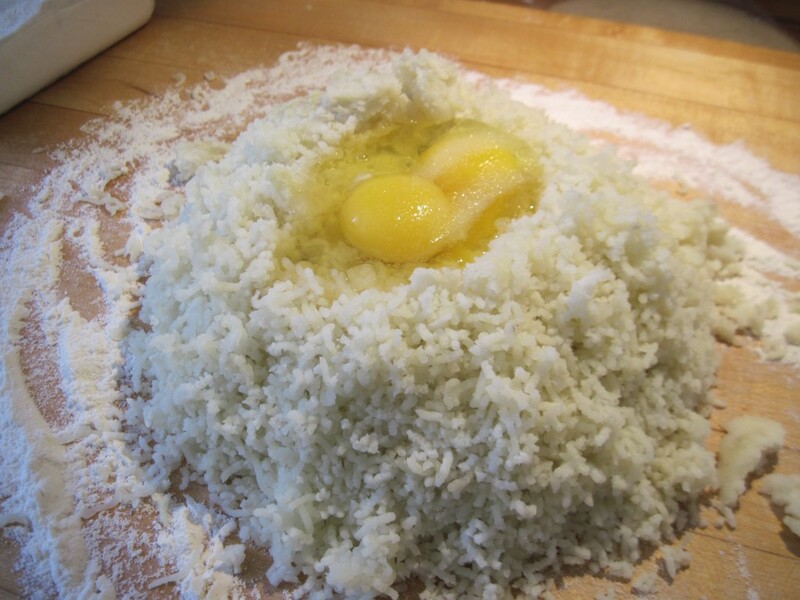 Gently mix the stuff with your fingers, adding flour as required and as possible; it is very messy, should remind you of those happy years of cooking in the mud puddle. When most of the flour is in, scrape and wash your hands. 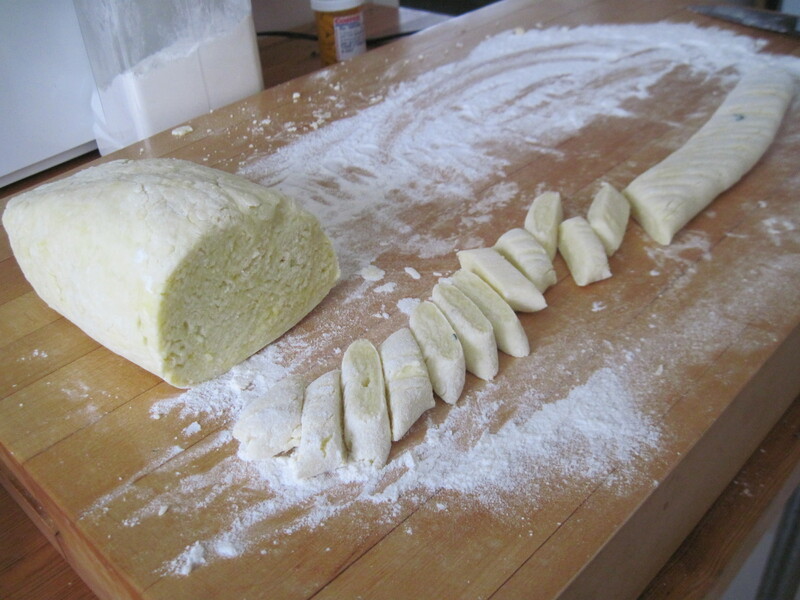 Place it on the floured surface and start rolling into a long snake. The snake diameter should be somewhere around 2-2.5 cm (1 inch). It can be smaller or larger, but should be even all along the snake. When snake looks ok, flatten it a bit with the flat surface of a large knife. You can, but do not have to, decorate the flattened surface with frequent shallow cuts of the knife, making a kind of checkered pattern… some people do it instinctively, but it does not influence the taste of the final dish. Cut the snake is small pieces (about 1.5 cm (½ inch) wide? ), attacking the snake not with perpendicular cut, but with slanted cut, so that kopytka come out longer than wider, with trapezoidal shape..
Gently pick up your cut pieces and immerse in boiling water. 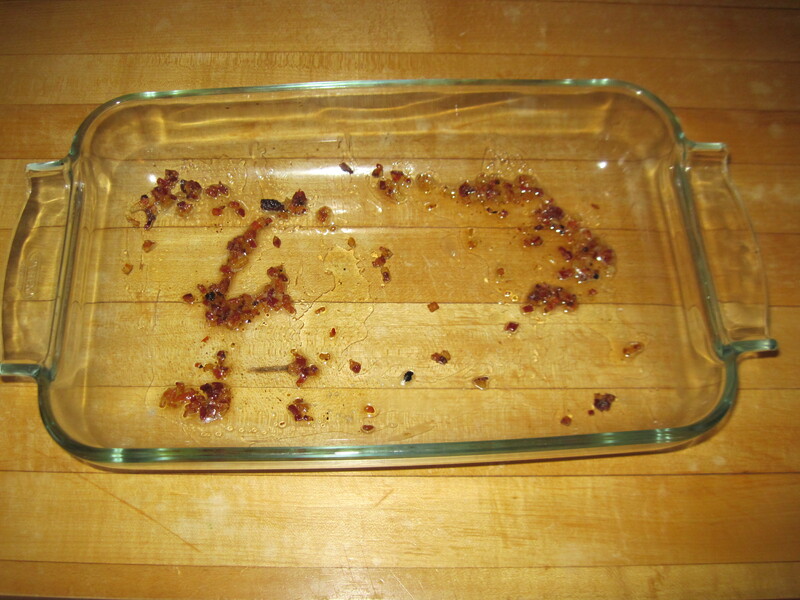 Now you can return to point 8, until the whole dough is gone, but must check the pot frequently. When kopytka start showing up at the surface of the water, they are ready for freezing (see noted above). otherwise you let them boil (simmer) for a few minutes. Take one out to test for doneness (must taste cooked!). Out of the pot they will come quite sticky and will want to retain very close contact with their brothers and sisters. 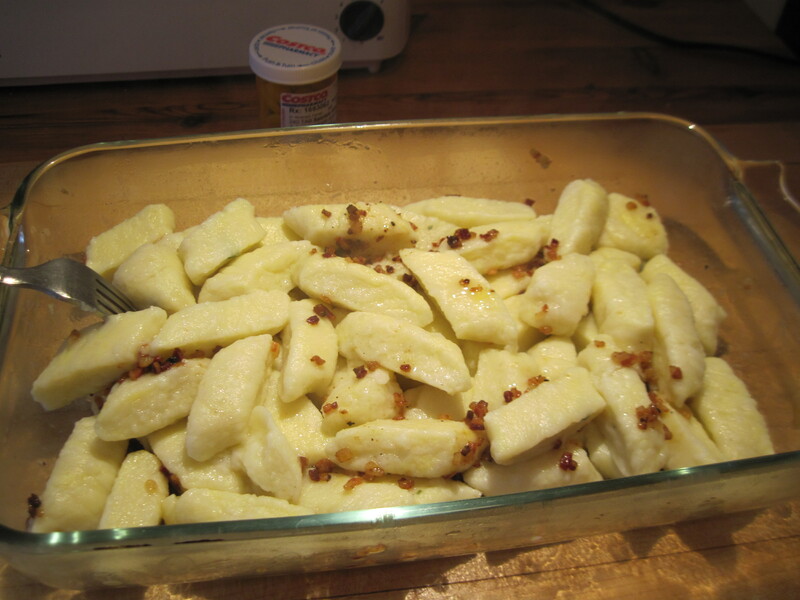 you prevent it by applying some greasy substance (melted butter, bacon fat..) . Here we place them on the glass serving dish which already has a bit of bacon droppings.. to make sure kopytka will not stick together.If intended for freezing or serving later, cool them down in a bowl of ice cold water. When cool they will not stick together..